These are pretty much always called Mysis Shrimp. Mysis shrimp also commonly known as opossum shrimp for the way they carry their broods, can be important to anglers as a curious bi-product of fisheries management practices. Fish and Game departments looking for a way to supplement the diets of planted kokanee salmon introduced these species from the Far North decades ago into many of the newly formed reservoirs. While not providing angling opportunities in the impoundments, they are often trapped in the dam's turbines and flushed down the tailwaters by the millions to feed the waiting trout. Their stunned or dead state makes them easy pickings. When these events occur the fish will really focus on them. The carapace of this Baetisca laurentina nymph is highlighted in green. The compound eyes of a male Isonychia bicolor mayfly spinner. Compound eye: The eyes of many arthropods, including insects and crustaceans, are composed of anywhere from 12 to 1,000 facets called ommatidia. These are called compound eyes.). Carapace: A hard, protective shell on the back of an animal. In mayflies, this refers to the enlarged section of the mesonotum which forms the "humps" of Baetisca nymphs. Compound eyes: The eyes of many arthropods, including insects and crustaceans, are composed of anywhere from 12 to 1,000 facets called ommatidia. 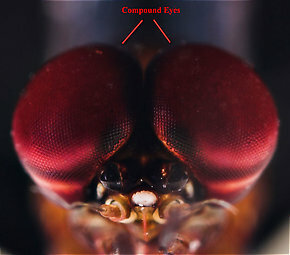 These are called compound eyes.